The classic Sergei Prokofiev composition Peter and the Wolf (1936) is torn apart in young performance artist Marc Arthur’s new version of this timeless tale, which looks at how childhood narratives can drive misplaced notions of innocence and purity. Ten young performers, ranging in age from seven to fourteen, enact a series of conceptual and fast-paced actions that draw from over 80 different literary and pop culture sources to tell the story of Peter in the Wolf, in which a boy captures a wolf and takes him to the zoo. A children’s chorus and a troupe of child ballerinas elevate the most dramatic moments of the production and, through acts of group humiliation and violence, viscerally remind audiences that children are not always so innocent or kind. At the same time, a huge white canvas in the back of the space gradually fills with line, shape, and form as the performers reconstruct the Peter story as a painting in which each color represents a different character. Each audience will witness the creation of a painting unique to that night’s performance. 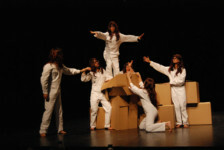 Employing a host of postmodern performance techniques—particularly inspired by the manic, electrified performance style found in the work of Iranian-born theater director Reza Abdoh—the actors and dancers in Peter and the Wolf work from a script compiling dialogue from figures ranging from Aristotle to Maya Angelou, and from Samuel Beckett to Michael Jackson (see full list of sources in “About the Script” below). With this wealth of remarkable material, and using the extraordinary skills of these young performers to tell this classic fable while simultaneously deconstructing the mythology surrounding such tales of child heroics. Marc Arthur’s work strips theater of its essential elements, fusing physical media with live action to articulate a combined logic of the performing and visual arts. His shows have been produced by LaMaMa, Dixon Place, New Langton Arts, and The Living Theater. Arthur frequently collaborates with legendary underground filmmakers the Kuchar brothers and beloved drag performance artist Vaginal Davis. 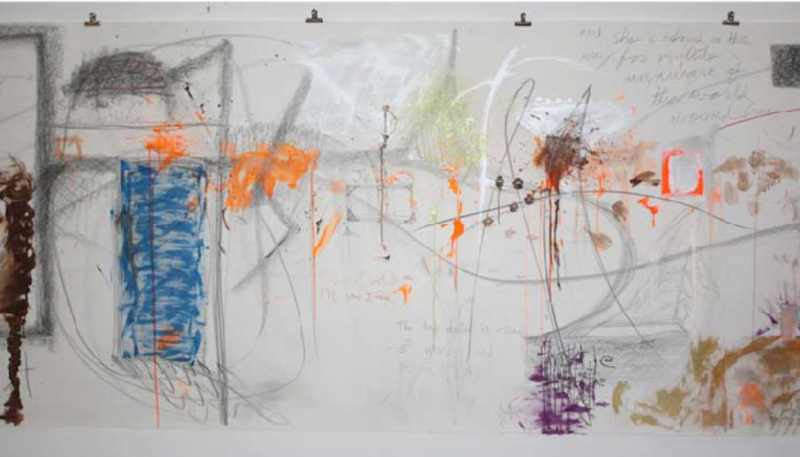 He has been an artist-in-residence at the Emily Harvey Foundation, Venice (2007) and Frise, Hamburg (2009). Arthur studied at Universität der Künste, Berlin; the California College of the Arts, San Francisco; and in the dramatic writing program at Tisch School of the Arts, NYU. Sources for the script, written by Marc Arthur, include Reza Abdoh’s The Hip-Hop Waltz of Euridice, Maya Angelou’s I Know Where the Caged Bird Sings, Aristotle’s Metaphysics, Anton Chekhov’s – The Witch and other stories, Antoine de Saint-Exupéry’s The Little Prince, Fyodor Dostoyevsky’s Notes from the Underground, Ralph Waldo Emerson’s Society and Solitude, Federico García Lorca’s The House of Bernarda Alba, Gabriel García Márquez’s Love in the Time of Cholera, William Gibson’s Neuromancer, William Golding’s Lord of the Flies, The Brothers Grimm’s Little Red Riding-cap, Ernest Hemingway’s The Old Man and the Sea, Michael Jackson’s Grammy Legend Award Acceptance Speech – March 1993, Jonah 1:17, King James Version, John Keene’s Annotations, Soren Kierkegaard’s Fear and Trembling, Rudyard Kipling’s The Jungle Book, Stanley Kubrick’s 2001: A Space Odyssey, John Landis’ An American Werewolf in Paris, Charles Mee’s Agamemnon 2.0 W. S. Merwins The River of Bees, Ovid’s Metamorphoses, Harold Pinter’s Moonlight, Sylvia Plath’s The Bell Jar, Edgar Allan Poe’s The Tell-Tale Heart, William Shakespeare’s Hamlet, Shel Silverstein’s The Giving Tree, Sophocles’s Electra, Jack Spicer’s Golem, Gertrude Stein’s Doctor Faustus Lights the Lights and Chris Croker’s sensational YouTube video Leave Britney Alone. The Performance Project @ University Settlement provides established, emerging and young artists and local audiences with opportunities to connect and enrich each other’s lives. Our aim is to encourage greater participation in the live arts and to help cultivate diverse creative communities on the Lower East Side. University Settlement is one of New York’s most dynamic social service institutions with deep roots on the Lower East Side. Each year University Settlement’s diverse programs help over 25,000 low-income and at-risk people build better lives for themselves and their families. With an impressive legacy as the first settlement house in the United States, University Settlement has been an incubator for progressive ideas for 125 years, offering pioneering programs in mental health, early childhood education, literacy, and adolescent development that set the standard. Building on the strength of this experience, University Settlement now provides services at 21 locations in lower Manhattan as well as in upper Manhattan and Brooklyn.